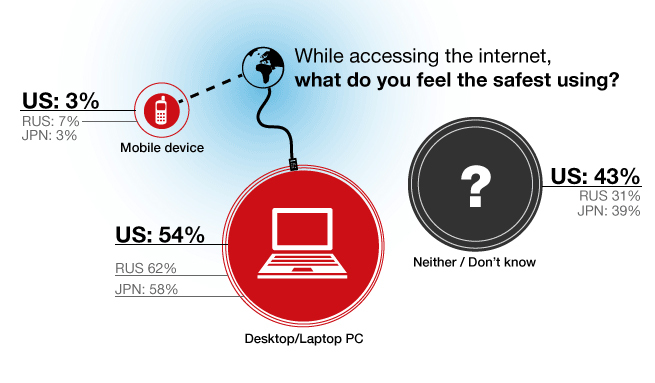 This is an illustration of an online survey that was conducted by one of the online magazines which asked people about their most preferred and safest medium to use while accessing the internet. This survey mainly focused on those living in the United States, Russia and Japan. As you can see, some countries preferred the labtop over the mobile phone and vice versa while others seemed indifferent about preferring one medium over the other. 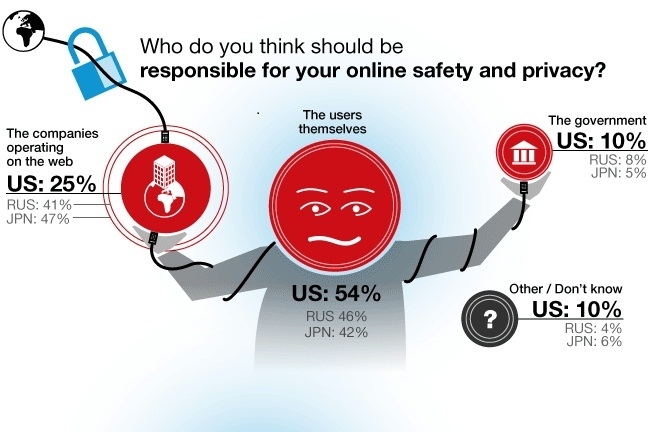 This is another illustration of the same magazine whereby online users from the United States, Russia and Japan reflect on this issue of who's responsible for their own online safety and privacy. In my own point of view, I believe that the companies operating on the web are the ones held responsible for protecting our own online safety since the governments all over the world are overwhelmed with many serious topics that are certainly more important than personal security and privacy on the web. Additionally, we, as part of the online community, wouldn't be as effecient in protecting our own online identities as those companies that are definitely specialized in this. Similarly, here's the response of the same sample about the different things they do to protect their privacy while being online. It is evident that most people use the antivirus softwares to have this feeling of online safety…..but do you think is that enough to wipe out all the personally-related information on the web or there should be some more other potential methods to be used? 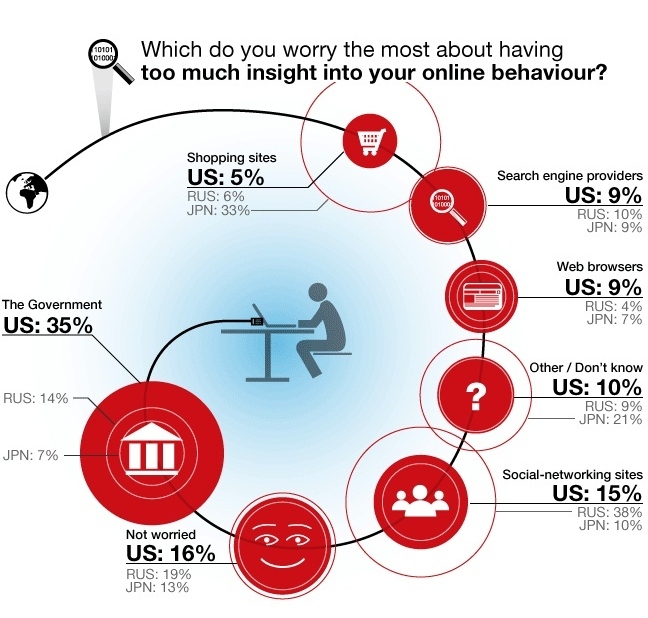 From this visual representation, as you can see, most of the people in this sample seem to be worrying about having their online behavior and content revealed to the government and social networking websites as well, a thing that signifies the fact that the majority of online users in such countries are actually deeply involved in both political and social talks. Surprisingly, in this visual representation, violation of online privacy or in other words, being a victim of internet fraud is a part of the people's daily worries in life. Not only that, but also this worry is in fact having a large percentage among the other present worries so there should be a crucial effort from the part of the several online entities to ensure our online safety because we are never sure if our online data is kept forever on the web or not even if we deleted them after that. 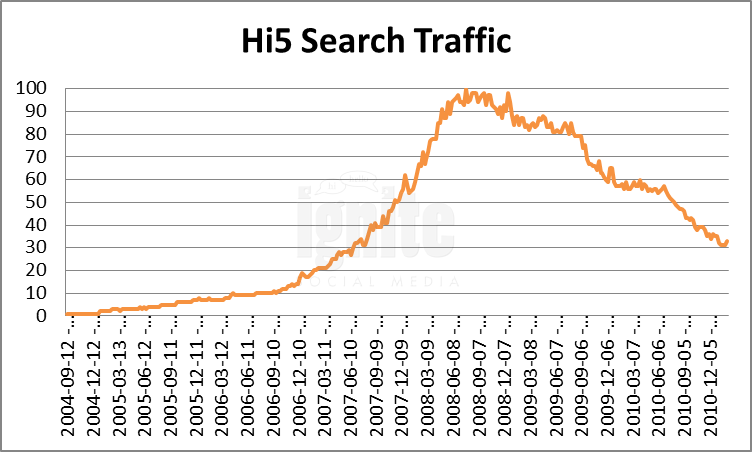 This graphical representation actually proves my point that online users especially youth are inclined towards Facebook while ignoring the old social networks like Hi5 for instance. However, despite of this, they still keep their old accounts on such old-fashioned social networks without deleting them or even doing anything about them. Personally, I don't think that this is appropriate because no one knows what these accounts could cause us in the near future…….I am not pessimistic but I am truly concerned about the immortality of online information issue. 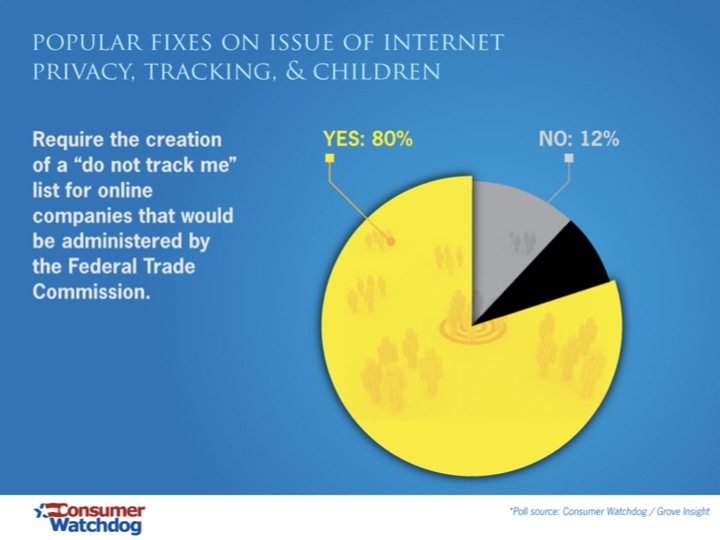 This is a graphical representation of an online survey about Internet privacy and tracking which included this question that asked people if they would require a "do not track me" list for online companies that would be under the adminstration of the FTC or the Federal Trade Commision. In fact, 80% of the people surveyed recommended this list while only 12% did not recommend it, a thing that shows that people are concerned about the online tracking and information preservation issues.